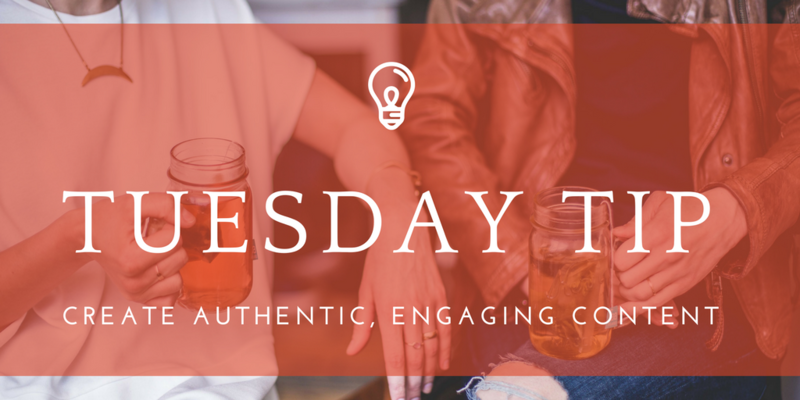 Tuesday Tip: Create a content marketing strategy that speaks to your audience. Valentine's Day is a day of love. For some, corny cards and the clash of red and pink can be what it's all about, but for many, the Valentine's we remember most are genuine and personal. The same can be said for content marketing. The best content marketing strategy is one that works to engage a target audience. To write in an engaging way, the content should feel like it's coming from people that know the reader's pain and genuinely care to help. If you're realizing your content strategy isn't working, and it doesn't quite do this, it may be time to build a content strategy that does. First, what is genuine content all about? This week's Tuesday Tip can practically be summarized in above quote from Stephen at CMI. We get so caught up in keeping up with the crowded social media realm and getting our content found, that we forget why we're writing in the first place. Content marketing is about speaking to your audiences needs so you can connect with them. Once you've created a meaningful connection, hopefully they use your service or product as a means of meeting their needs. If you're struggling to apply this to your own content strategy, think of it as a conversation between two people. If you could have a member of your target audience in the room, what would you say to them? How would you help? Those topics are the place from where the topics of your posts should stem. So how do you build out this content marketing strategy? If you know the questions your audience is asking, you can answer those questions through your content. The hope is that they'll read through your posts and find their solution through your company. Have your entire team note why clients come to your company and what their needs are. At ArcStone, we often find we write our best blog posts when we answer a real client's question. Suggest having a meeting at your customer's office instead of your own. The more you can see your audience's world, the better you can understand what challenges they may be facing. Talk to your audience. Chances are, you have the contact info of plenty of people who fit the description of your audience. Call up some of your clients or send out a survey to uncover their needs. If you've done this before, it may be time to do so again. Optimize your content for SEO. You may be answering your audience's questions, but they'll never find your answers if your content isn't optimized for search. Use this post as a reminder of what your content marketing work is all about. Remember the goal of your company is to provide a service or product, and your blog and content is crafted to help people find you. Recenter your content marketing strategy on what it's all about – answering the needs of your audience.